Deaf dog: Thumper, a 9 year old blue eyed Hungarian Moosehound (OK, really a Great Dane/Aussie mix) who is a water certified search dog for Butte County and a cadaver certified search dog for the California Office of Emergency Services. Thumper is our hero — he's been voted into Dog Fancy's Hall of Fame. Go Thumper! 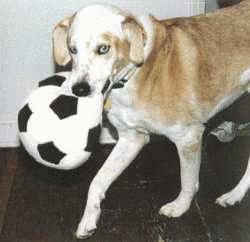 Thumper went to the Rainbow Bridge in January of 2002, and is missed by the entire Deaf Dog Community. Other pets: Please (aka RedDawg or Weasel), a red tri Australian Shepherd who is a certified wilderness search dog. Deaf dog: We got Midge when she was just 5 months. We didn't know she was deaf, but once we found out, it didnt make a difference. She loves to play tug-of-war and fetch. 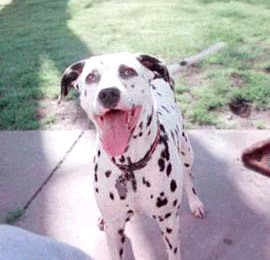 Deaf dog: Casey is a 2 1/2 year old Dalmatian. Casey was a lost soul that showed up on our lawn 1 1/2 years ago. We tried to find her owner, but no one claimed her. We had no intention of owning a dog at the time, but what did we know? She quickly became the best thing in our life! We now live in a "Casey-centric" world! She's a bit goofy (OK, she's A LOT goofy) but that just makes life more interesting. This world would be a better place if everyone had a deaf dog like Casey! Deaf dog: I rescued Melbourne (Deaf Albino Aussie) and his step-sister Sydney (hearing Aussie/Border Collie Mix) from Riverside Humane Society in Riverside, CA. He is white as a ghost all over, soft as a down pillow and has beautiful blue eyes. 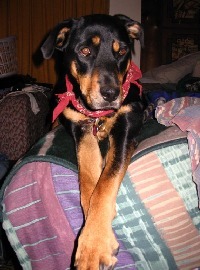 Deaf dog: Indy is a one year old Rottweiler mix. "Indy has been with me since she was 10 day's old. Found out she was deaf at 4 months. She has slept with me since she was just a baby. Indy has so much charactor and is so funny, fun, curious, loud, everything is a game to her even when she's looking for something to get into mischief with. She's a bit of a thief and loves to chew everything up, guess you could call her destructive, but she does keep me on my toes and I need that! She loves to get in the bathtub or shower with me so it's very easy to give her a bath. She also love's to be vacuumed. She Invents her own toys and they range from toilet brushes, toilet paper, tennis shoes, door knobs, any bottle she can chew that crunches loudly, well what can I say but she's very lucky to have me as her mother because most people would have gotton rid of her by now. She has to go with me everywhere because of her separation anxiety, and I need her with me because of my anxieties. So she is a bit of a therapy dog too. We are both disabled and we love each other. She loves kids but still plays too rough. I would like to get her approved eventually to visit sick children. She has so much spirit. I love her just the way she is even though she is such a brat, she definitely keeps me laughing!" 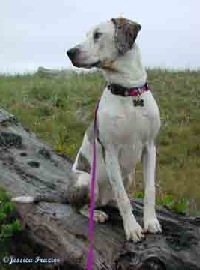 Deaf dog: Shiloh is a one year old Catahoula. 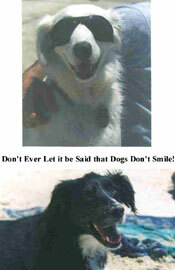 "Shiloh was born deaf and was about to be euthanized. I'd never had a deaf dog, but my mother has always been hard of hearing. Learning to adapt to a deaf dog was not hard for me." Human companions: Jessica Frazier, 2 children, and her boyfriend.